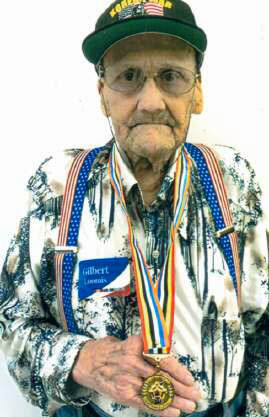 Gil Loomis recently became the latest of VFW Post 8870’s members to receive this award. 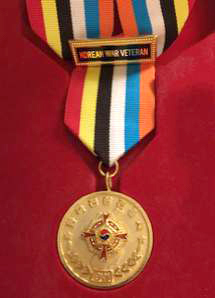 Korean War veterans who served in country or in Korean waters during the Korean War, June 25, 1950 to July 27, 1953 are eligible for the Korean Ambassador for Peace Medal. 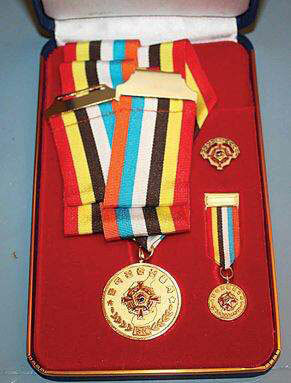 The medal is an expression of appreciation from the Korean government to US service men and women who served in the Korean conflict. Other members have received this recognition, including several during an award ceremony held at the Edmonds Community College Veterans Day observance in 2016. Congratulations Gil and all the other recipients. Six members of Post 8870 were among 23 Korean War veterans honored by Edmonds Community College at their annual Veterans Day celebration November 2. The event filled the college’s Black Box Theater to standing room only. Post 8870 member Jim Adams, Tom Hallums, Gil Loomis, Paul Poppe, Phil Sacks and Dan White were so honored. Other speakers at the event included state representative Cindy Ryu, who as Shoreline mayor was the first Korean American woman to be mayor of a U.S. city. Lynnwood Mayor Nicola Smith and Edmonds CC President Dr. Jean Hernandez also spoke. 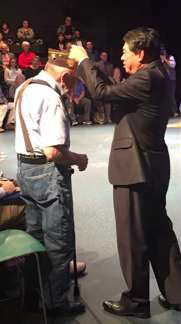 Our immediate past commander, Jim Blossey—also a Korean War veteran—was emcee for the program.